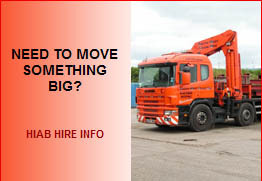 Crane Hire, Hiab Hire and Machinery Moving Specialists. Whether you are looking to lift something large in your garden, at your site, on your building or if you need to transport a large or abnormal load across the country, we can provide a professional and complete crane hire, hiab hire and transport service. Call us today on 0800 2943381 for free friendly advice on hiring a crane, including ancillary equipment and personnel for lifting, transportation and machinery moving. 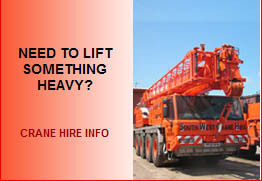 Click on a link below to learn more about our crane and hiab hire services. With six strategically based depots in the South West managing our fleet of mobile cranes and lorries all operated by qualified, professional staff, we can provide a solution for every crane lift situation. Having been in the crane and hiab hire business for over 35 years, we have a wide range of equipment available together with experienced and skilled staff necessary to tackle any crane lift. A crane for every job - no hire too small or too large. Contact Us today for free friendly advice on crane hire or hiab hire. Conditions of contract include CPA (Construction Plant Hire) and RHA (Road Haulage) terms, working to BS7121, LOLER and PUWER regulations.